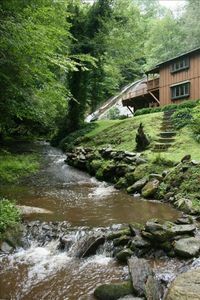 " Little Bear Lodge" is a very private, wonderful, green, solar powered waterfront home on pristine Bear Lake in the Great Smoky Mountains. 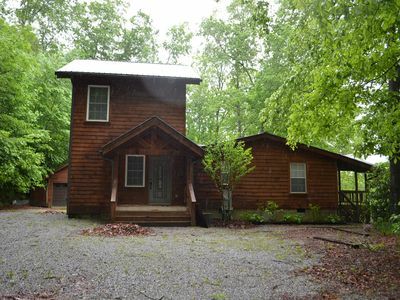 THIS PROPERTY IS ONLY ACCESSABLE BY WATER. 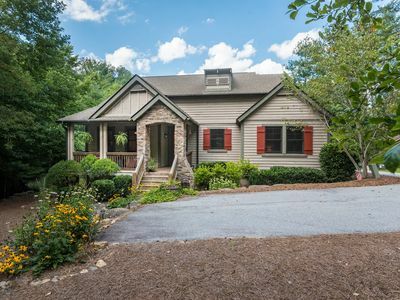 ( The Pontoon Boat ) To say this home is unique is an understatement. 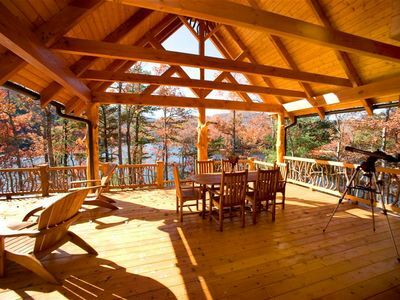 This 'Island Lodge' is surrounded by water on three sides with walk around decks and views of the lake and mountains from every deck and room. 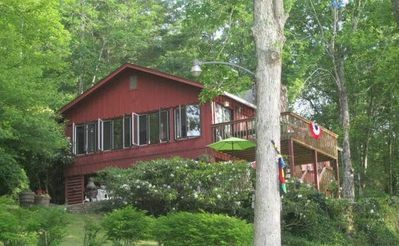 Little Bear Lodge is only accessible by boat but this makes for a very private lake retreat with no neighbors and views on all sides. There is also two docks. It is a short boat ride from the dock to the house. We have a good system in place to come and go as you like by boat, you do not have to be a master boat captain to drive the pontoon boat. Pets are welcomed but must be discussed and approved. There is a pet fee charged. 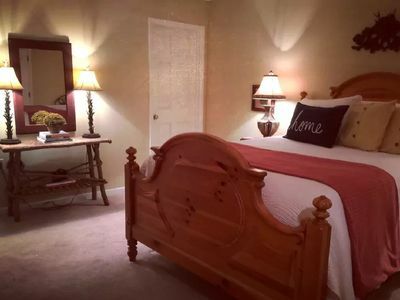 PLEASE note this is a wonderful home for families and couples, but occupancy is strictly controlled. This island home is very private and not for everyone. Please contact me if you have any questions and concerns. 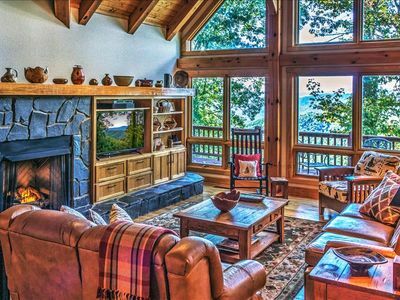 This rustic lodge features two fire places, a master suite with king size bed and large tile his and hers showers and bidet. 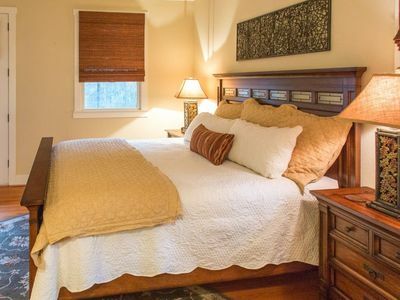 The guest room has a queen bed and private bath with claw foot tub and shower. Relive your childhood on the wonderful screened sleeping porch (Standard Bed). Sleeper sofa is also included in the den for added occupancy. 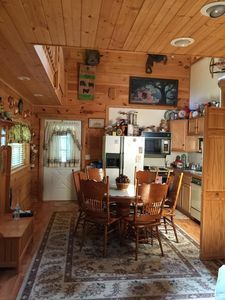 Great chef's kitchen with bar-stools for entertaining and a gas cook stove and oven. There are also three grills, two gas and one charcoal for all your outdoor cooking needs! 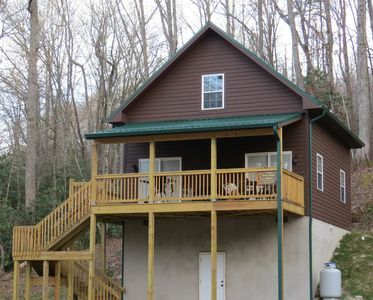 Don't forget to bring you music, this home has a top of the line sound system, Wi-Fi and Direct TV. Some of the best fly fishing in NC on the streams feeding into Bear Lake. Also great lake fishing! Take the boat to the many waterfalls only accessible by boat, there is one over 80 foot. 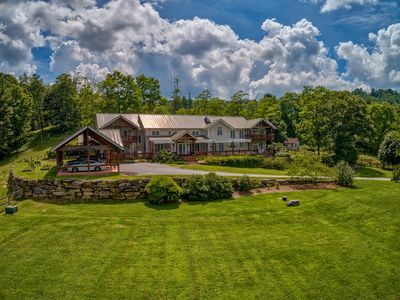 ** This unique property has some systems that are not conventional. There is no Central Air Conditioner rather a Crosswind air circulation system and large ceiling fan. 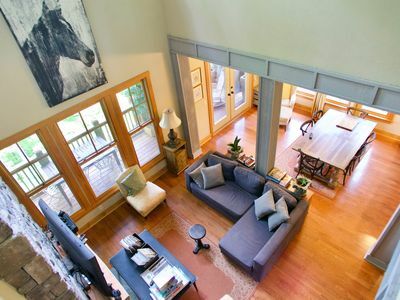 The house was designed to open up and allow the brisk breeze over Bear Lake to cool it along with large ceiling fans. Please note that if you must have A/C this may not be your best option. It s almost always cool. There is also a Rain/ Lake Water collection system with a cistern. It has a large charcoal filter for the entire house and individual charcoal filters in the kitchen. Because of the Solar system you must conserve power where you can and if we lack some sunny days there is a backup generator to keep you going! Not a problem , you just have to be mindful and not leave on lights and fans when you not in the house. 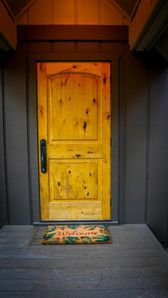 We provide fire wood, additional bottled water, and paper produces, towel and all linens. 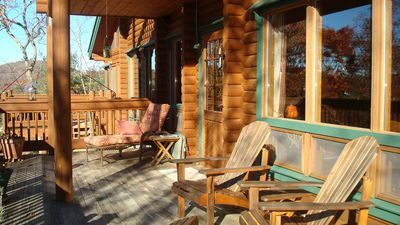 Enjoy time outside on the expansive deck an outdoor den with a wonderful stone fireplace, lounge chairs and cedar swing. Plenty of outdoor and indoor space for entertaining. A place to enjoy and build memories of great vacations. 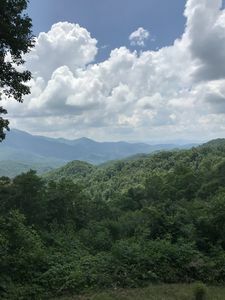 Visit nearby Cashiers, Biltmore Estate, Dillsboro, Bryson City, Asheville and more in Western North Carolina for an unforgettable vacation. 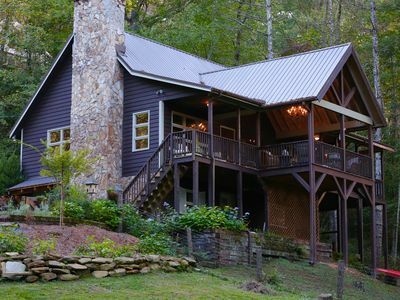 WESTERN NORTH CAROLINA: The mountain region is unsurpassed with its beautiful mountain views. 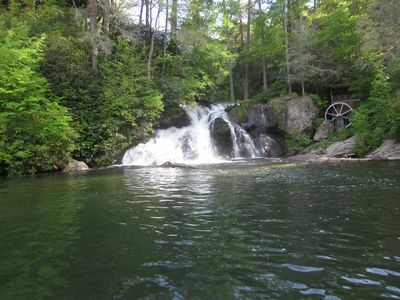 Western NC attractions include the heart of the Appalachian, Blue Ridge and Great Smoky Mountains. There are numerous attractions that offer fun and educational activities. 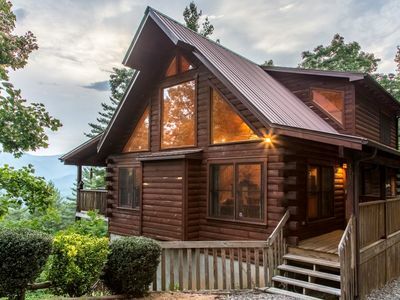 Plenty of small mountain towns to explore, Sylva, Highlands, Waynesville, Cashiers or spend time in Asheville shopping and dining in this city of diverse culture. 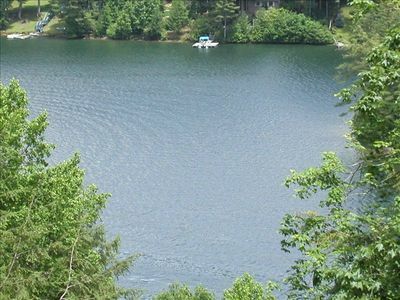 Activities include biking, boating, fly fishing, gem mining, hiking, horseback riding, river rafting on the Nantahala and Tuckasegee Rivers, lake fishing, tubing, water skiing and numerous waterfalls. If you would like to upgrade to the new " Aqua Patio" Pontoon boat with a 115 HP motor Please add $350 per day to your rental. 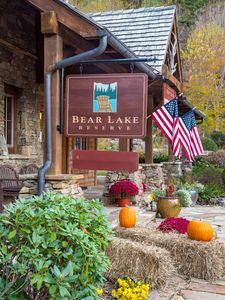 A 3% Convenience charge applies as fee collected by VRBO. 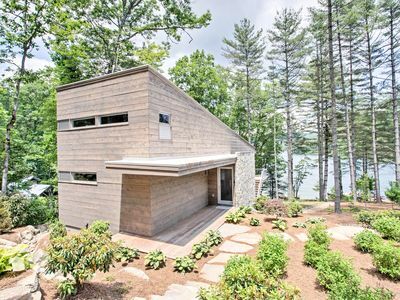 Modern Lakefront Home w/ Dock - 8 Mi to Cashiers!